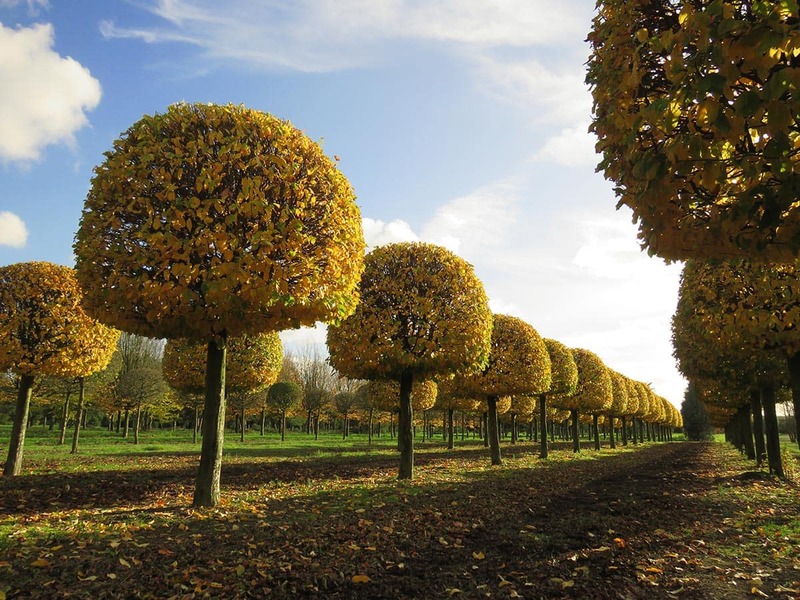 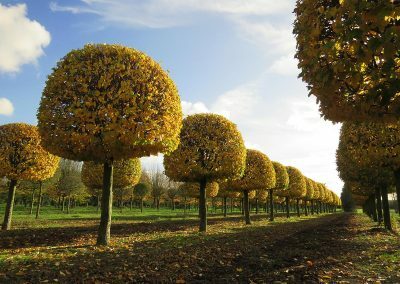 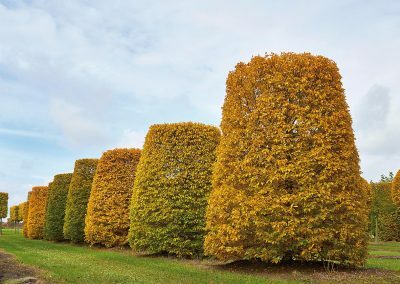 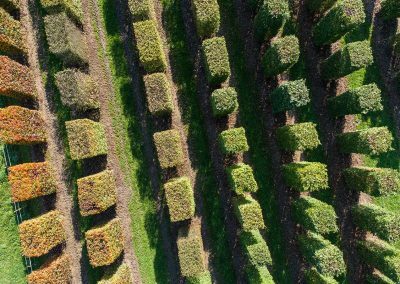 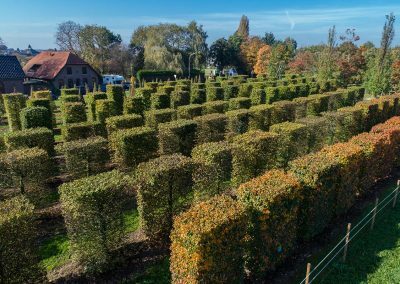 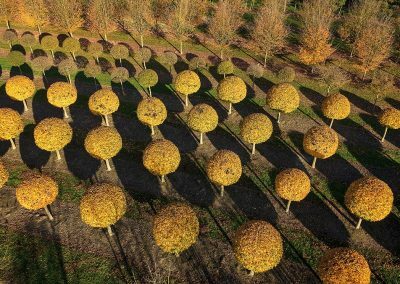 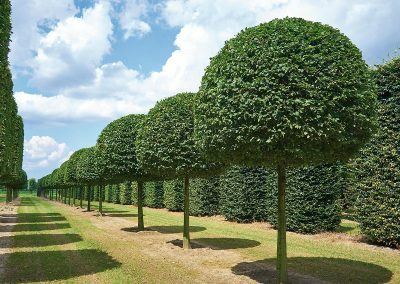 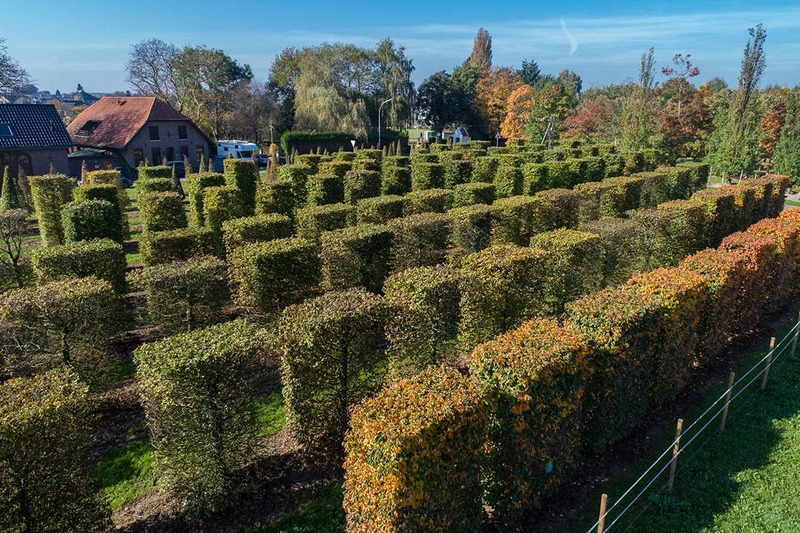 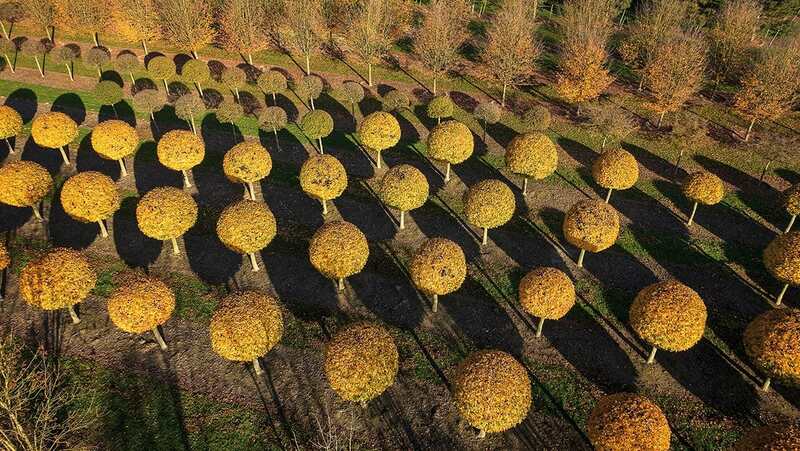 Deciduous shrub topiaries: boxes, spheres etc. 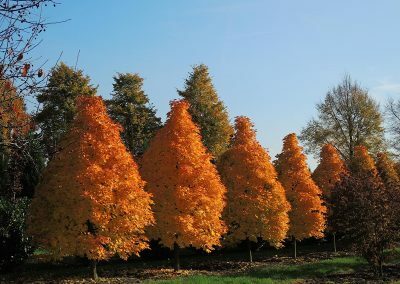 Broad-leaved trees from Lappen such as Tilia (lime), acer (maple), Fagus (beech), Quercus (oak) or Nyssa (Tupelo tree) offer the observer sensational autumn colours, while others are in attractive bloom in spring, including Prunus ‘Accolade’ Prunus yedoensis or Prunus ‘Taihaku’ (Japanese cherry) and a variety of other ornamental trees. 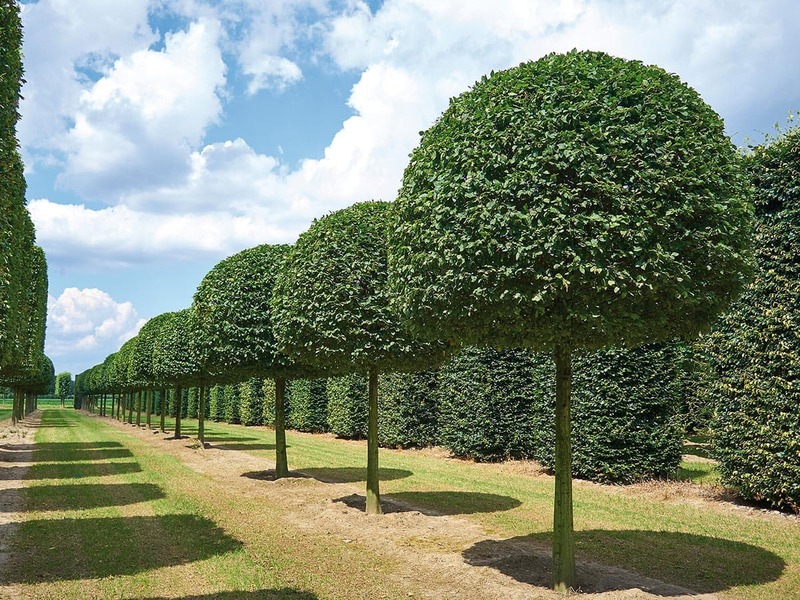 In summer they provide shade in streets, car parks and gardens or parks. 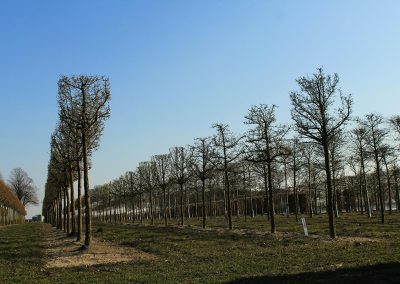 In particular these species with strongly developed crown and high growth, among them Liriodendron (tulip tree), are suitable as free-standing solitaires for parks and avenues. 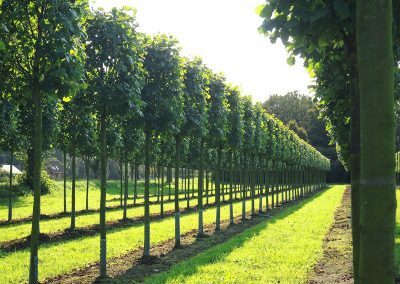 Acer platanoides’ Columnare Dila’ (Narrow-crowne Maple), on the other hand, is often planted in narrow streets or small parks. The frost-hard and wind-resistant but somewhat heat-sensitive Acer freemanii’ Armstrong’ (red maple), one of the 150 subspecies of the genus Acer (maple), is also suitable for planting in confined spaces and narrow streets. 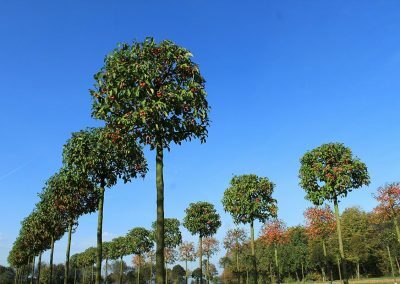 Its bark is silver-grey and it flowers with beautiful, orange-red flower panicles before the leaves are released in March. But it is not only the growth and the colours that are important when choosing the right tree. The climate and soil conditions of the future location play an important role. 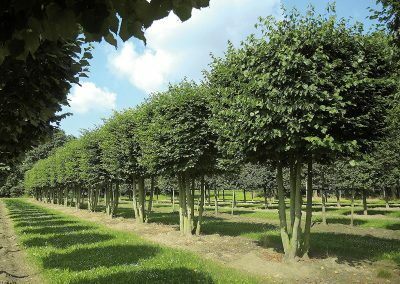 The uncomplicated Alnus (alder) has no special soil requirements. 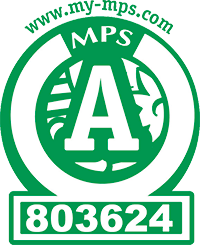 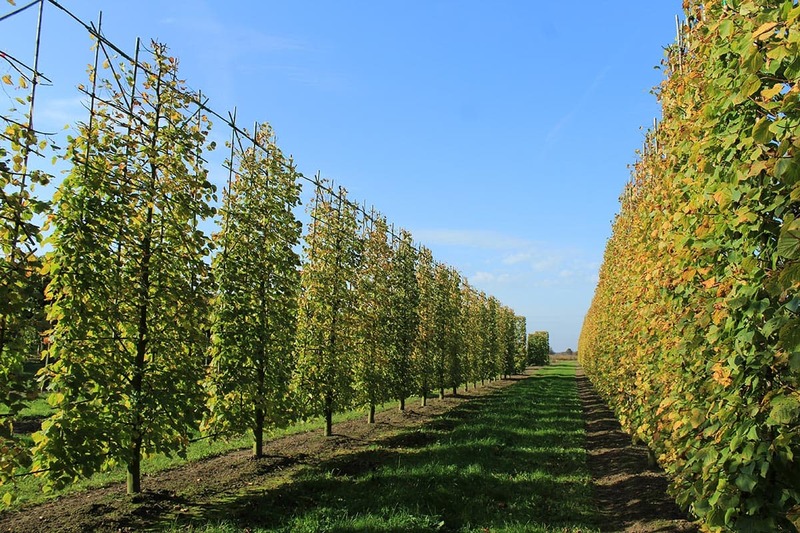 It thrives on nutrient-poor, dry soils, but can also tolerate a lot of soil moisture. 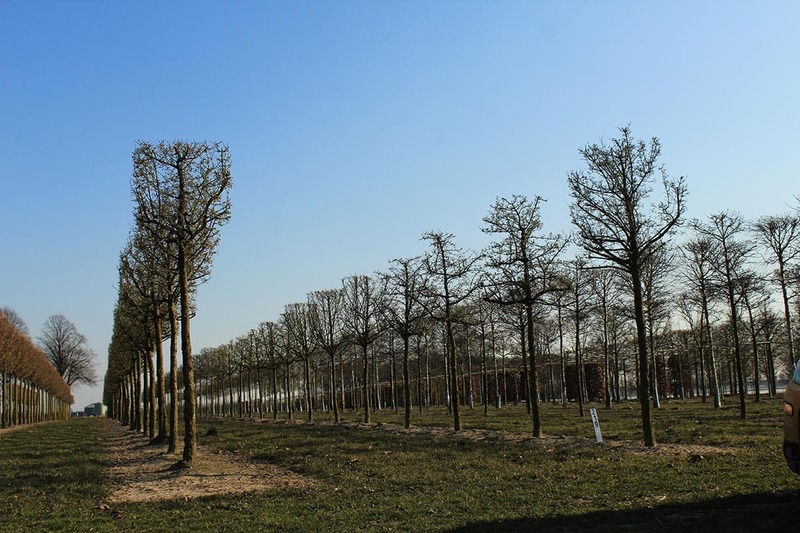 Quercus (oak), on the other hand, likes strong, deep soils. 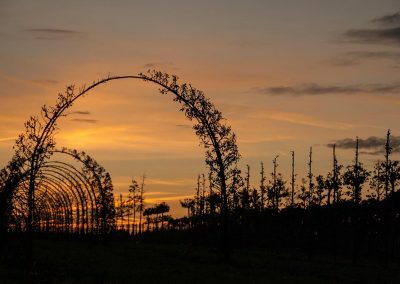 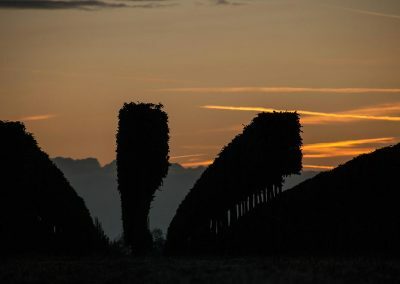 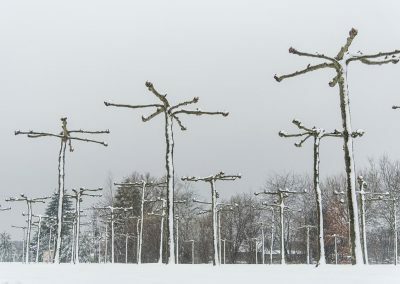 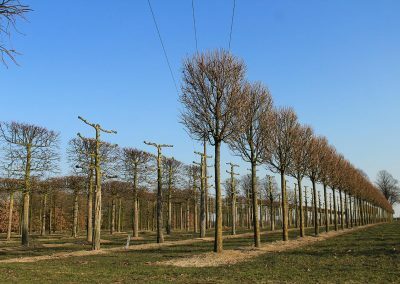 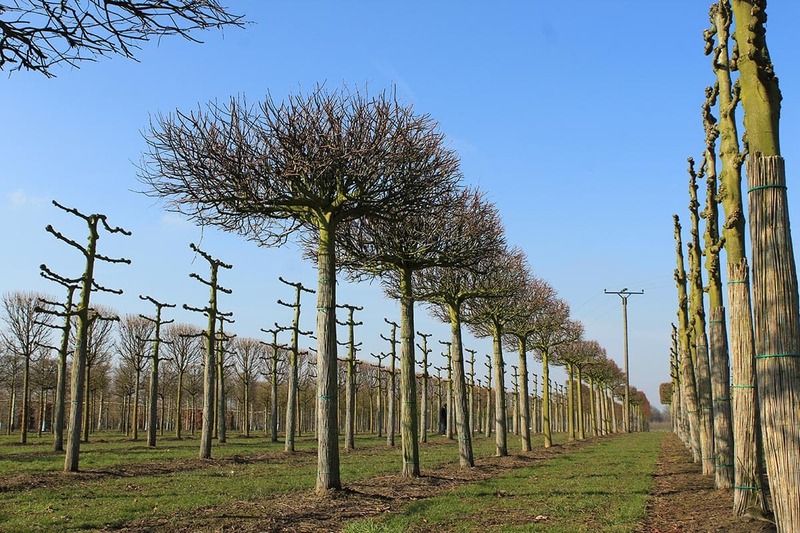 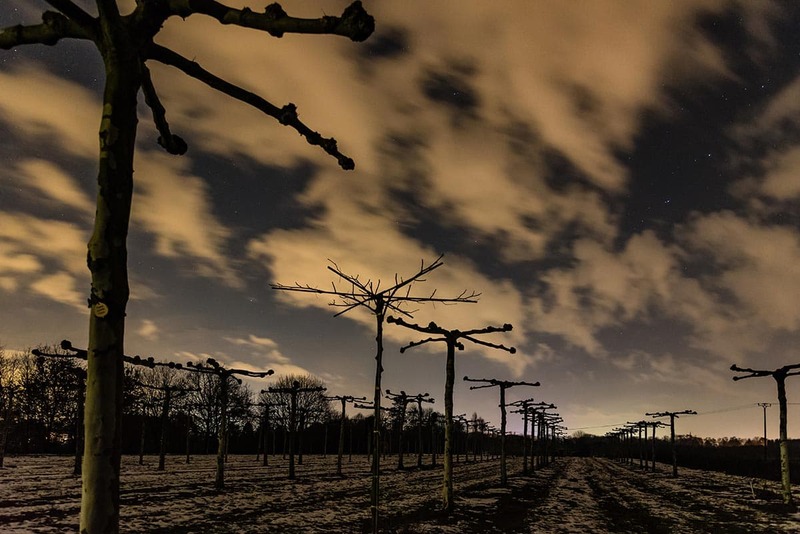 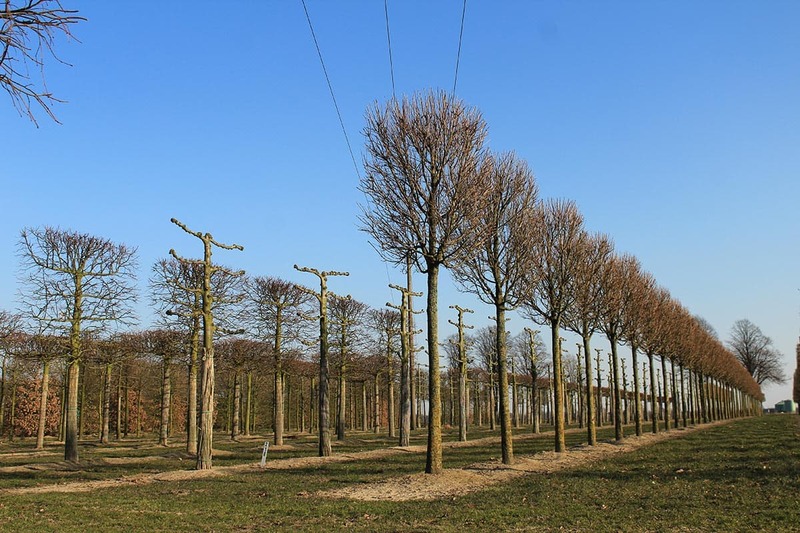 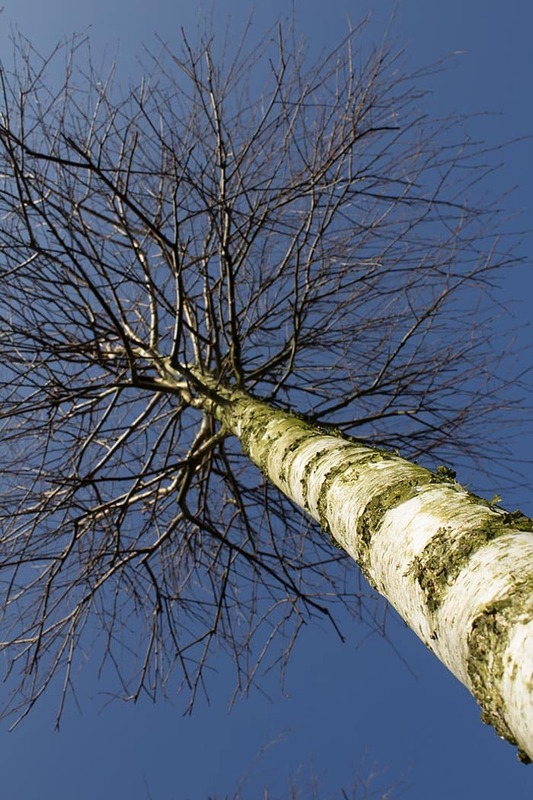 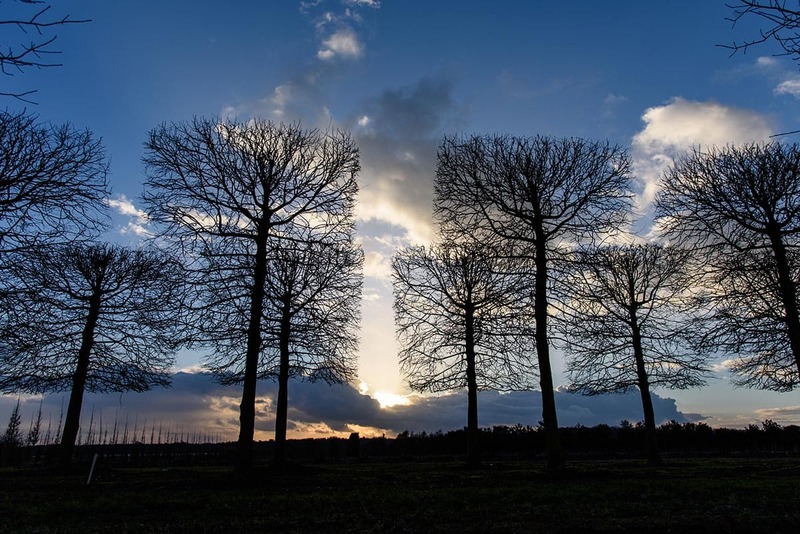 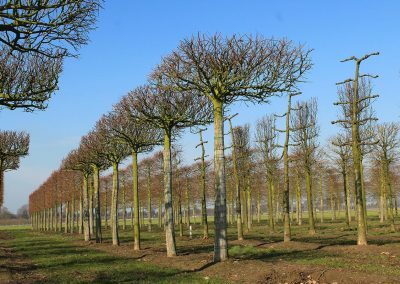 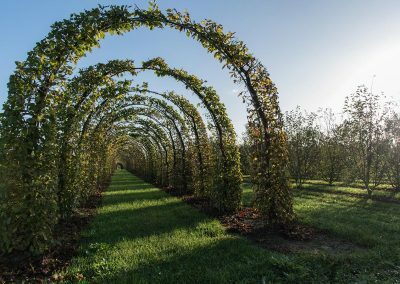 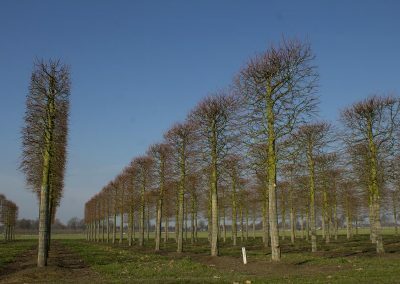 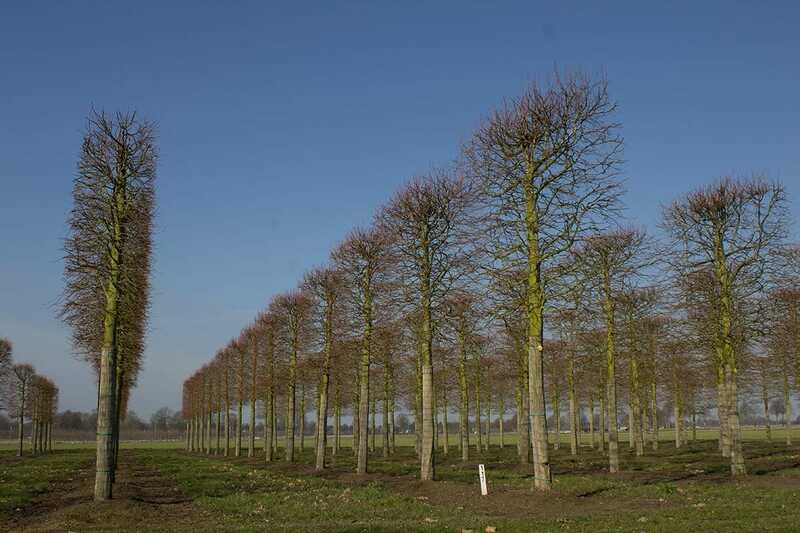 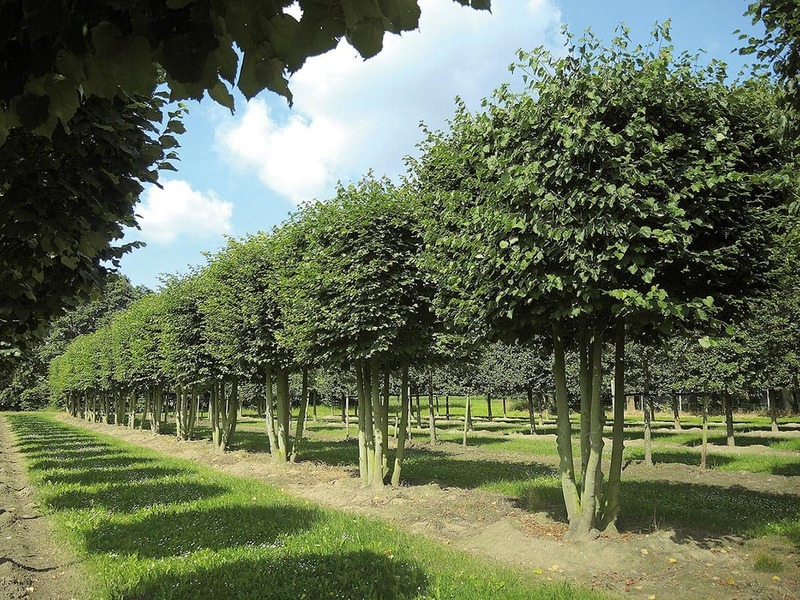 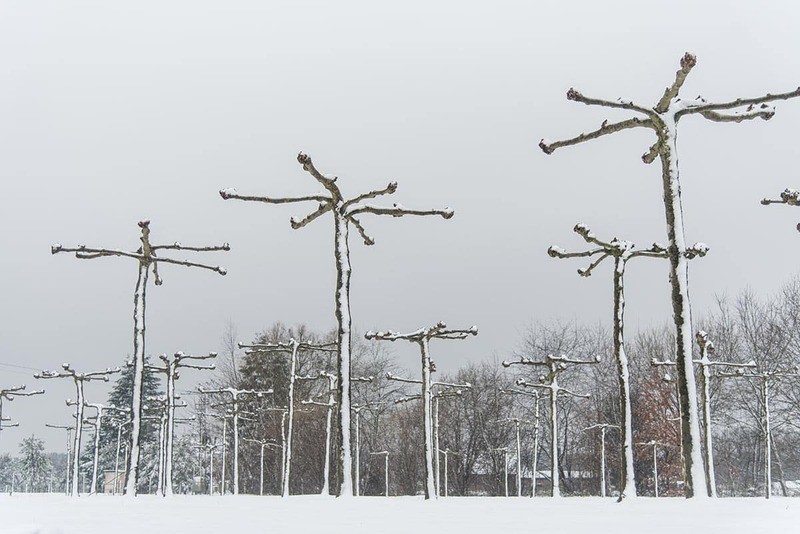 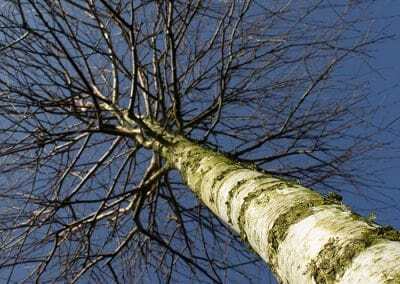 Under optimal soil and climate conditions, the trees from Lappen develop into true giants: In addition to Quercus (oak), Fagus (beech) and Ulmus (elm), the Acer (maple) can also grow up to 30 metres high and develop a magnificent crown in free standing. 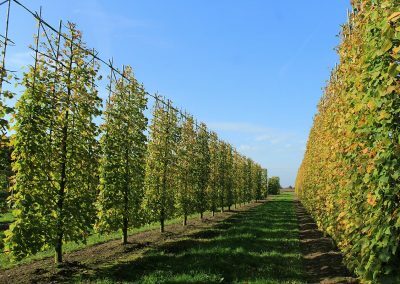 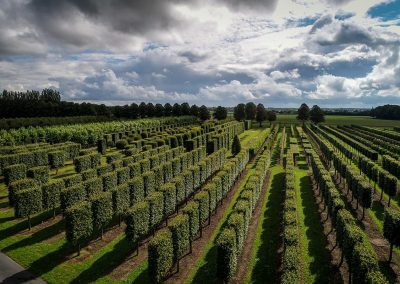 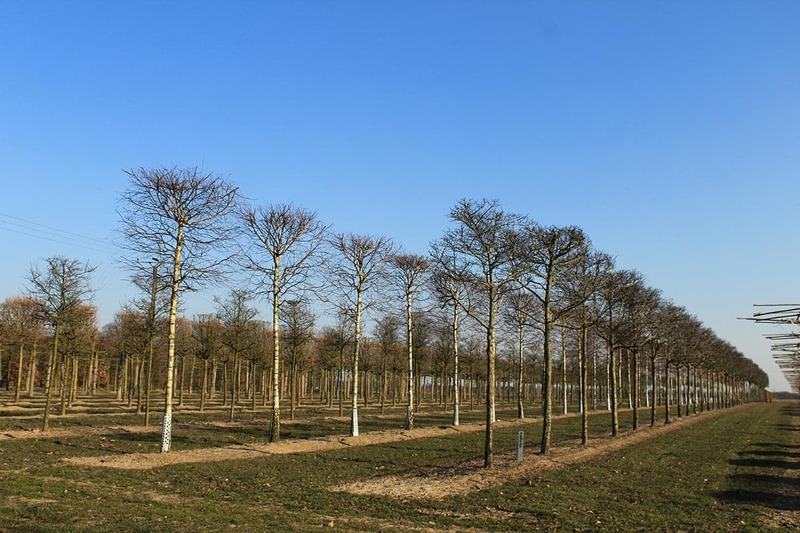 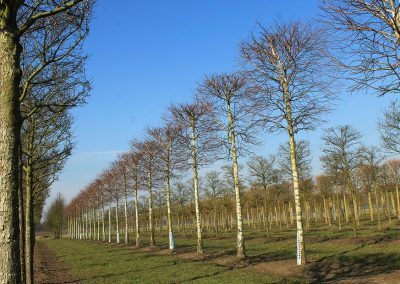 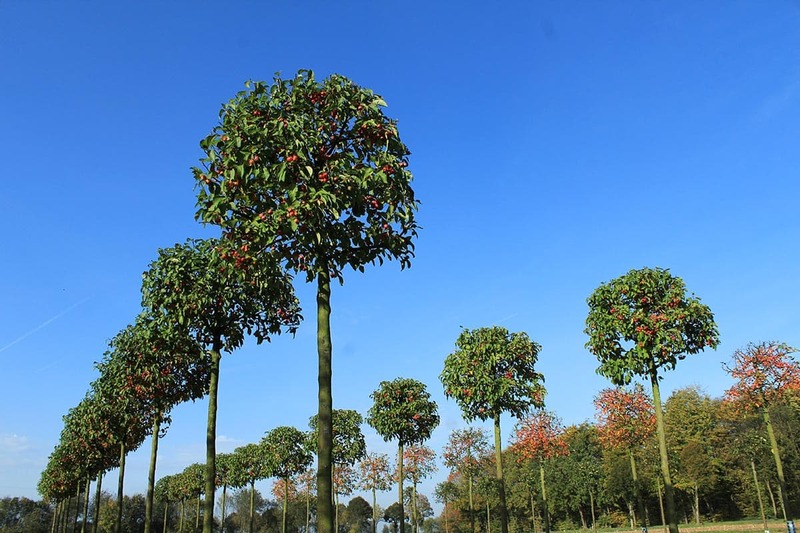 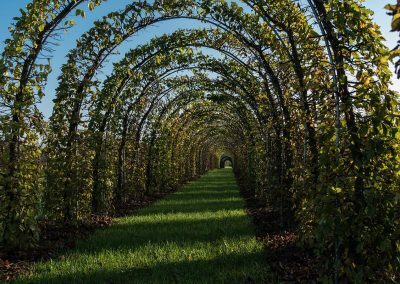 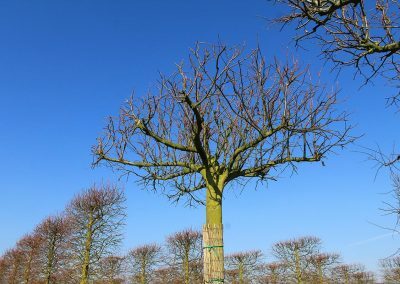 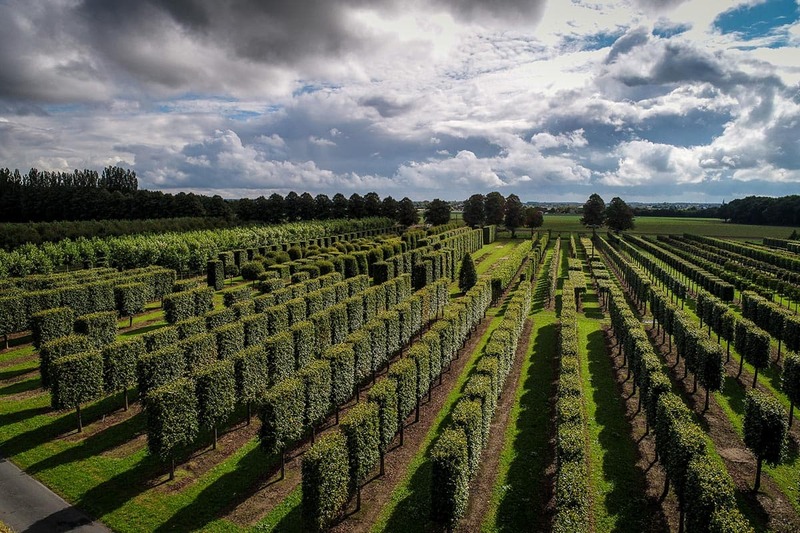 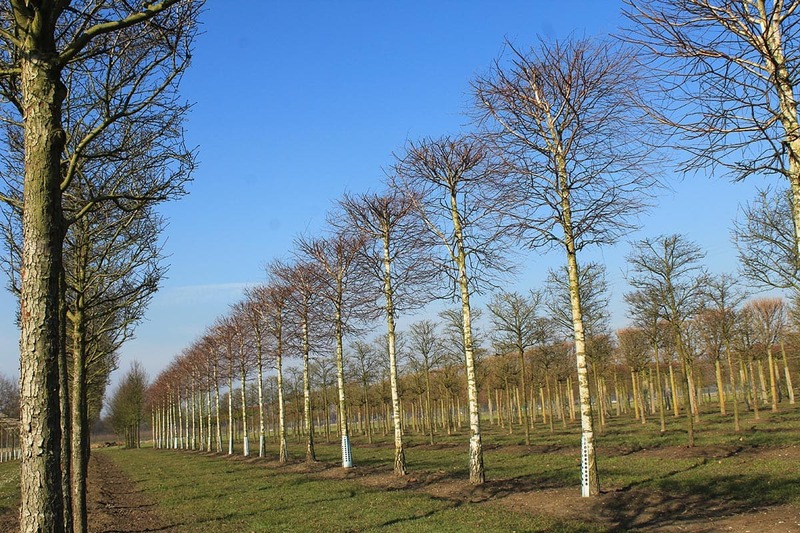 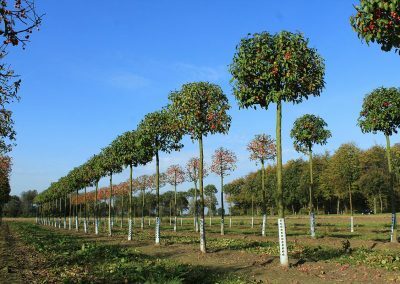 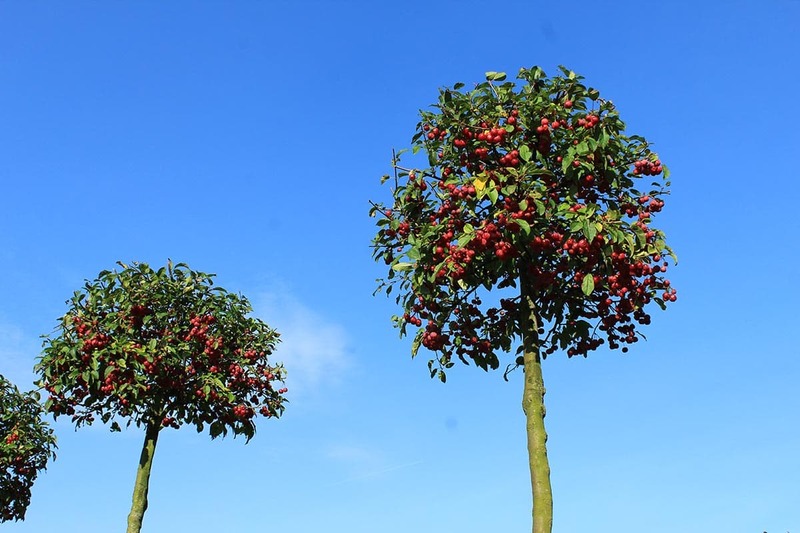 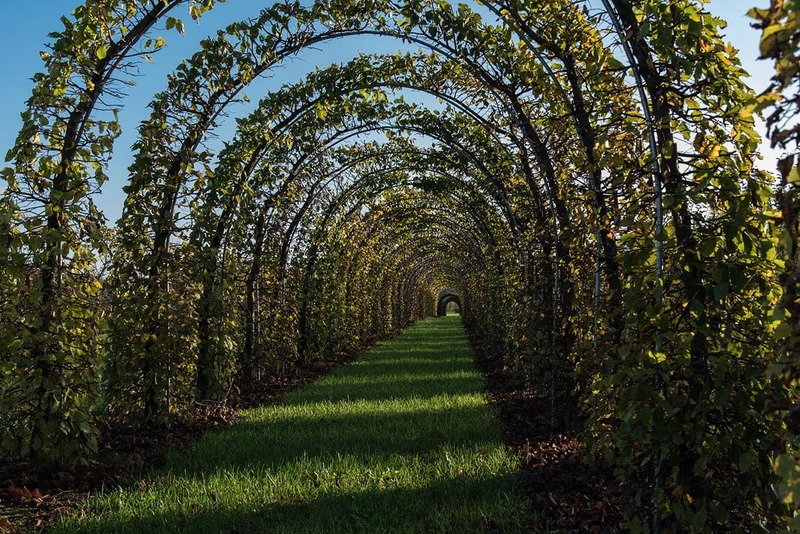 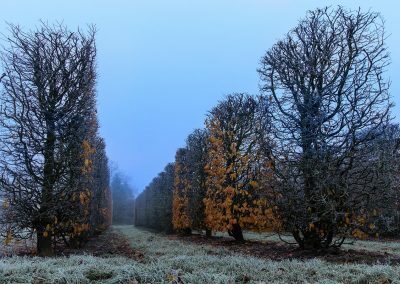 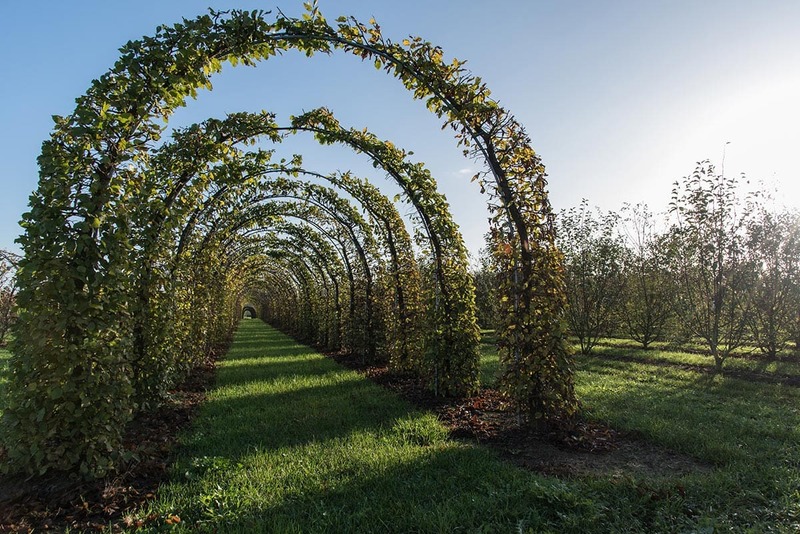 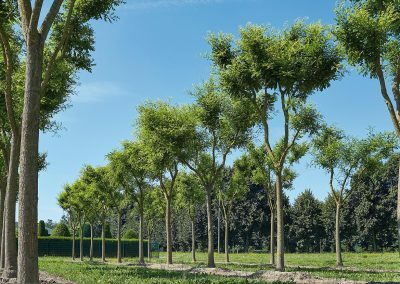 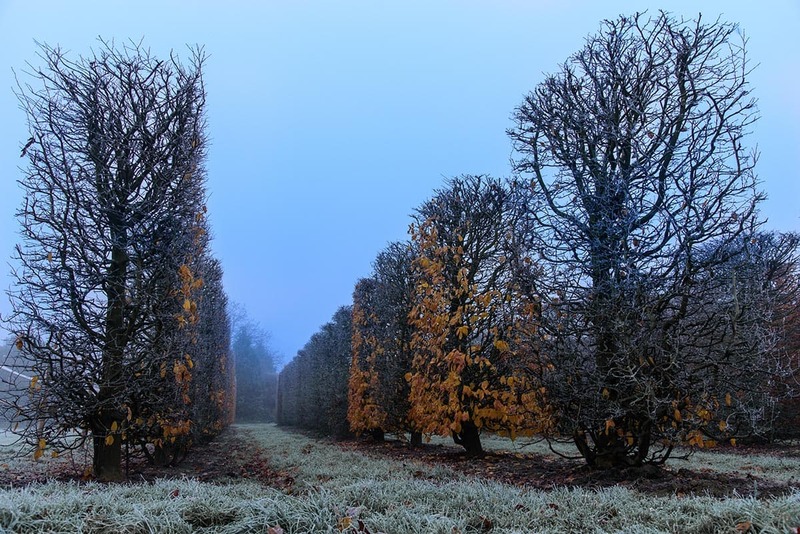 Among the deciduous trees in the nursery are also trees of the future, which are characterised by their vigour, life expectancy, heat tolerance, resistance or breakage resistance, among other things. 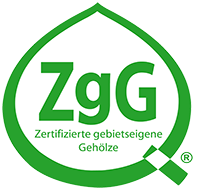 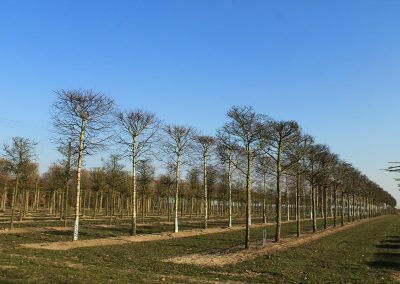 These include Acer campestre (field maple) in various varieties, Celtis australis (Southern Marigold), Acer buergerianum (French maple), Quercus cerris (Turkish oak), Ostrya carpinifolia (hop fractures), Zelkova serrata (Zelkove), Gleditsia triacanthos (Honey Locust) in different varieties, Koelreuteria paniculata (bubble ash) or Fraxinus ornus (Manna ash). 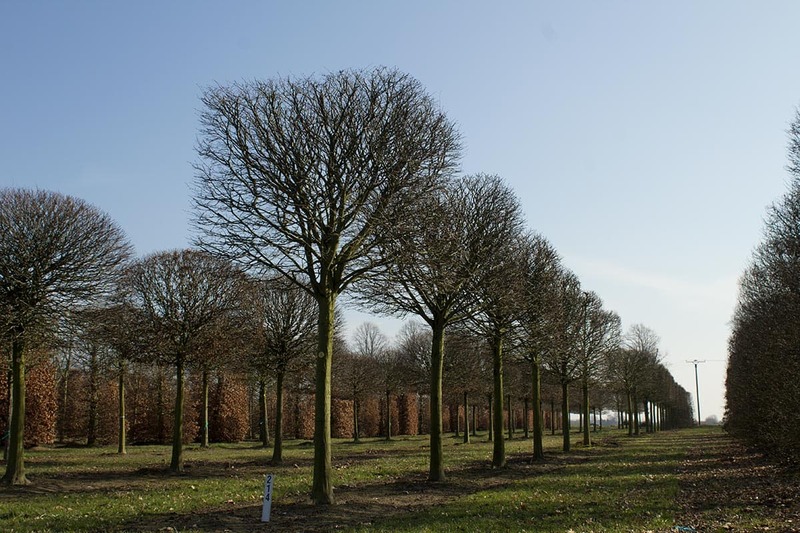 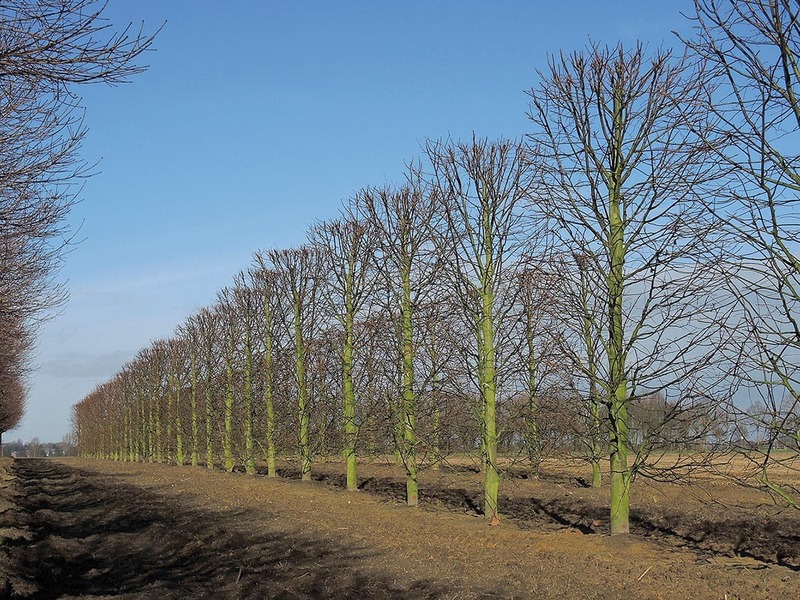 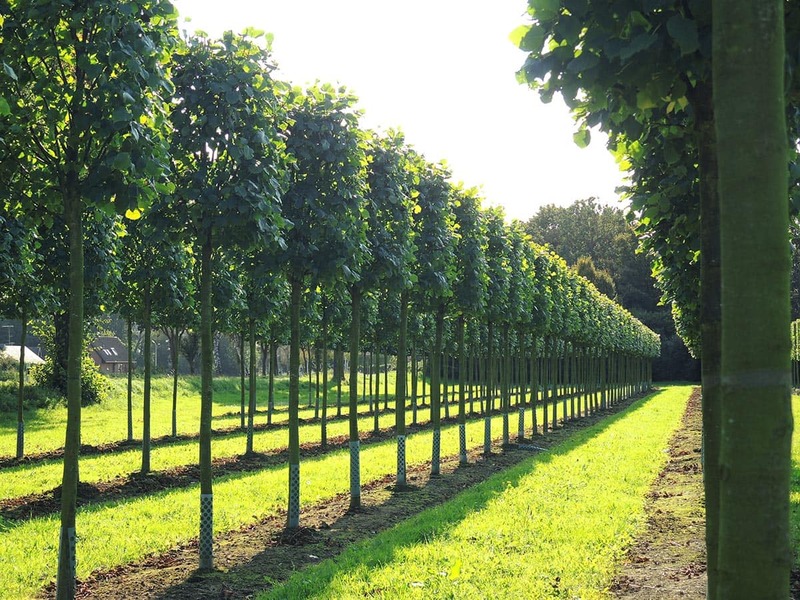 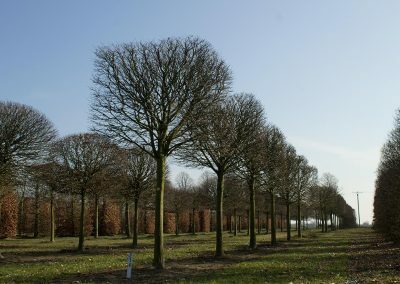 Another plant in the extensive portfolio of the nursery is Tilia henryana (Henrys lime). 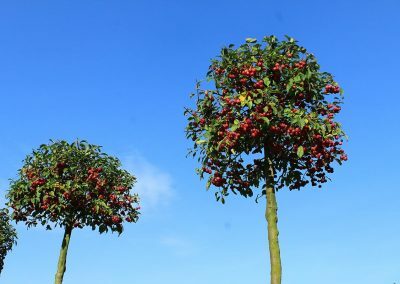 This produces particularly rich nectar and pollen and is therefore often approached by honeybees. 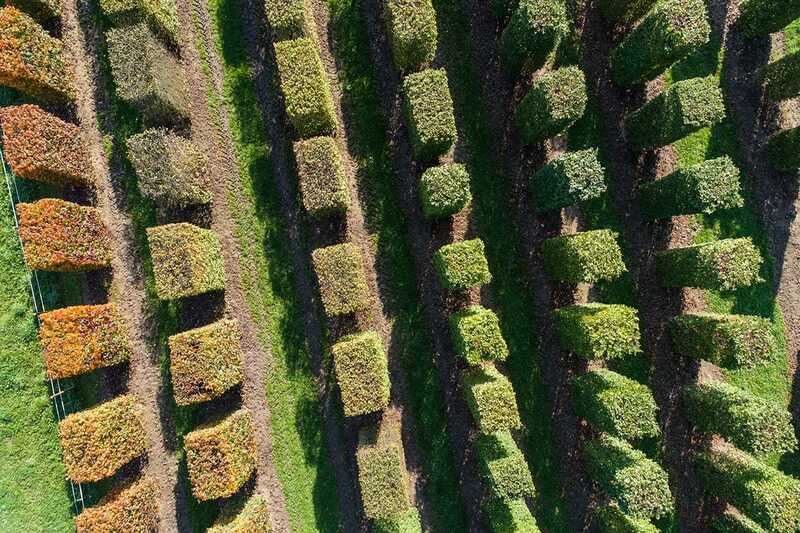 Furthermore, these ‘bee pastures’ are reliably suitable for fixing slopes and inland dunes.